New Hampshire growers interested in adding spinach to their winter crop production soon will have additional information to help them select which varieties to grow and when to plant, thanks to a research project underway at the NH Agricultural Experiment Station’s Woodman Horticultural Research Farm. Becky Sideman, a researcher with the NH Agricultural Experiment Station and extension professor of sustainable horticulture production, Kaitlyn Orde, a graduate student in agricultural sciences, and Connor Eaton, a graduate student in plant biology, are conducting a winter spinach trial to determine the most suitable spinach varieties and planting dates for winter production in New Hampshire in an unheated high-tunnel environment. 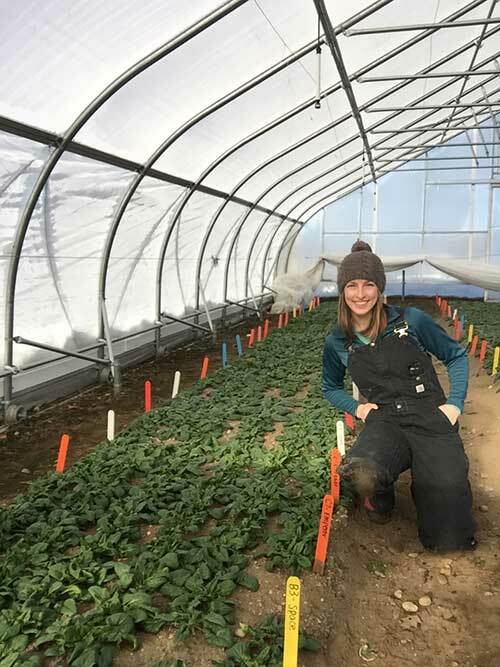 Whether a grower has existing high-tunnels that are unused in the winter and may be interested in starting winter greens production, or already produces spinach but is interested in other varieties and planting dates, this study addresses the range of grower needs. 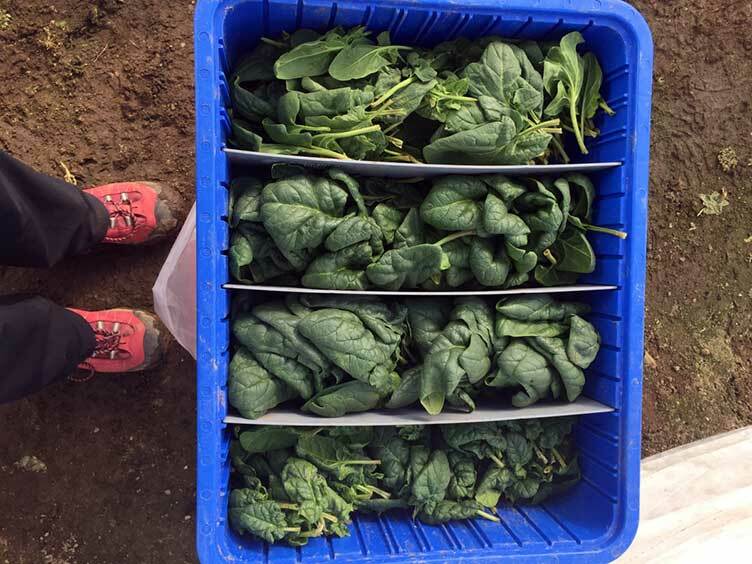 “Many New Hampshire growers are either interested in winter spinach production or already raise winter spinach to some extent in unheated high-tunnels, but there has been very little research that can help growers make decisions about planting dates or varieties for cold-season production in our region,” Orde said. “The traditional growing season in New Hampshire is very short, limiting the period for local food production. Growing systems that allow for an extended period of production can help support agriculture in the state and supply more locally produced food on a more consistent basis,” she said. Researchers are collecting yield, sugar content, ease of harvest, and average leaf size measurements from eight spinach varieties planted on six different dates from mid-September to early November. The varieties UNH is using are Regiment, Tyee, Space, Gazelle, Corvair, Renegade, Emperor, and Carmel. “Results from this experiment should allow us to confidently provide recommendations to growers on the highest yielding and quality varieties, and provide some target planting dates. Knowing the spread and peaks in production would allow growers to match their harvest peaks with good sales opportunities such as at Thanksgiving and Christmas, or stagger plantings to harvest continuously through the winter,” Orde said. Although the research project is ongoing, scientists report they already have seen great variation in plant type and growth habit between varieties, affecting ease and pace of harvest. They also have seen differences in leaf size, color, and texture, leading them to theorize that some varieties may be better suited for fresh eating, such as sold a salad mix or used in cooking. They stress, though, that all are delicious raw. According to Orde, researchers also have found that winter spinach production is incredibly low maintenance. Aside from harvesting and the occasional irrigation or pest control, it has been very easy to produce high-quality greens. Researchers have not encountered any major challenges this year, and the spinach has been very productive due to the warm weather. “Purchasing regionally produced food supports local farmers and economy, can help maintain an agricultural presence in New Hampshire for future generations, and increases the availability of fresh foods. Local greens can be much fresher than those that have travelled across the country, and it may be that winter-grown greens have a longer shelf life than greens grown in milder climates. One of the things that we have found is that winter-harvested spinach is much sweeter than that harvested when the temperatures are warmer,” Orde said. Researchers will continue harvesting until plants are either no longer producing saleable spinach leaves or until the tunnel is converted to another crop for spring or summer production, as a grower would do. They then will start summarizing their results to share with farmers and gardeners that are interested in growing spinach during the cold winter months.